I love this time of year, I am a huge fan of Christmas and New Year's and eating lots of food. I want to share my holiday joy with you too! Here's my second annual holiday giveaway! This year I want to give you a choice between two brand new Canadian Christmas-theme books. 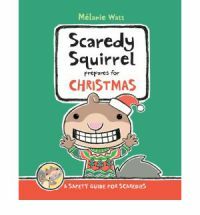 Please choose from either Island Santa or Scaredy Squirrel Prepares for Christmas. Enter using the rafflecopter below. This giveaway will last one week, closing at midnight Japan time (12 hours ahead of EST) on December 2 so I have time to send the book out to you! This giveaway is open internationally!! Our elementary library students would love these Holiday books options in our circulation. Hoping with fingers crossed. Crap at commenting but always read your blog and love your recomendations.Thank you.Also,thank you for inspiring me to get together a selection of Christmas themed books for my two.We will start reading a Christmas story each night during advent; they are so excited and the countdown to Saturday has begun(although I must admit that the chocloate advent calendars that my aunt sent also have something to do with the excitment,lol). PS Never fussy when it comes to books but if I had to decide on one of the above,I think that Island Santa would get the vote. My favorite holiday story is The Gift of the Magi, I first read it when I was 8, and it left a deep impression on me. My little kid mind was stuck on the horror of her losing her hair and he losing his (watch?) and the gift they bought each other was for the thing they lost. But as I grew up I grasped the deeper meaning of the love to give up something so dear to you to make someone happy. When I was back my friend got it for my son and it's great. It isn't a story book, though. It however, does teach the alphabet and the provinces and territories with wonderful illustrations. I'm not sure where you are located. I'm in Tokyo and if you are close I can lend it to you if you like! Oh I love Christmas too and Christmas books rock! Wombat Divine is a great Aussie Christmas story. We don't have many holiday books yet, mostly just the 'Little Golden Book' classics which I've just started reading to Xander. My personal favourite though is 'Grug and his first Christmas'. I'm not sure if the 'Grug' series by Ted Prior is internationally known, but it's a great Aussie series. I grew up with it and intend to ensure Xander will too. We've been enjoying 'Maisy's Christmas Eve' the last few years and I'm sure it'll be popular again this time. Even though K is 4 now, he shows no sign of growing out of Maisy! Thanks for the giveaway - I read your blog often, but its the first time I`ve commented - useless I know! Love Christmas, although spending the day in Japan when hub is working and no one else really celebrates is a bit lonely... looking forward to my son growing up and celebrating with me!! It's a Wonderful Life - the movie. My husband shared this movie with me our first Christmas together. I remember watching 'A Christmas Carol' or 'Scrooge' with my two older sisters when we were young. My father used to tell us some stories before going to bed but not reading to us. Now that I have a baby, I just can't wait to read a book for him, but for now he enjoys picture and animal books. Growing up we split our Christmases between the UK and South Africa so I grew used to cold and sunny Christmases alike, but never a sunny island Christmas. 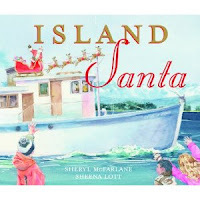 I do LOVE the charitable undertone to Christmas in Island Santa as we were always made to wrap up an old toy or two in exchange for Santa's generosity. Merry Christmas and lovely giveaway - thank you! I second Lisa B. The Grinch rules!